I use the graphic with course leaders, students and researchers as a way of showing where information-handling behaviours and values fit within the academic learning journey. I’ve found it useful because it illustrates recognisable aspects of the research process alongside some less familiar ones, which may be threshold concepts in themselves, and it helps me situate what I talk about in a way that makes it more relevant to what they’re doing as researchers. I presented about the jigsaw and how I use it at the ALDinHE conference in March – the slides are available on Slideshare. I’ve also made a downloadable version which includes the blank jigsaw template, so if you want to make a version with alternative pieces you can! 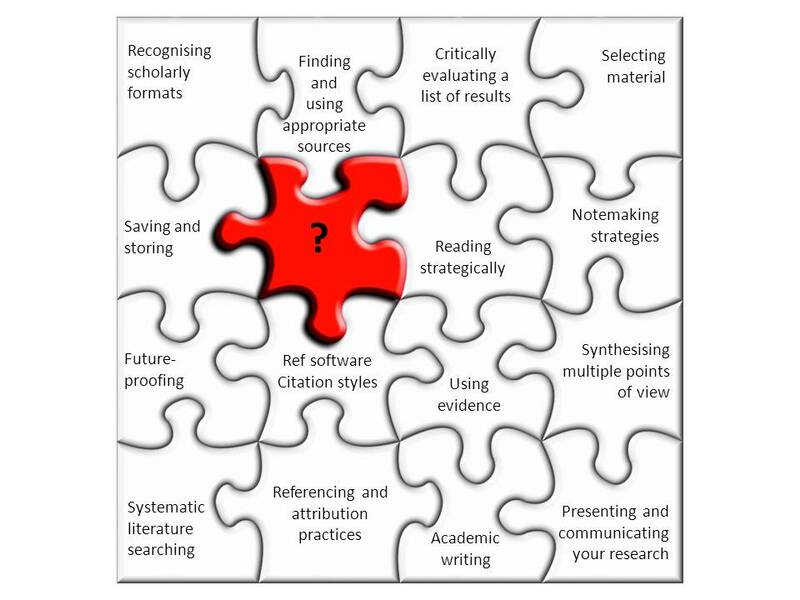 I’ve been mulling a lot recently over how to describe what it is I teach, why information literacy isn’t the same thing as learning to use the library, and above all why it can’t be covered in an hour at the start of term. I’ve been using the concept of the ‘information landscape’ to give an idea of the scale and complexity of the information-handling abilities needed by researchers. This idea extends neatly into a broader metaphor schema where the subject knowledge is the landscape, while information literacy is the set of navigational and survival tools you bring with you into that terrain – the map, the compass, the energy bars, the binoculars. 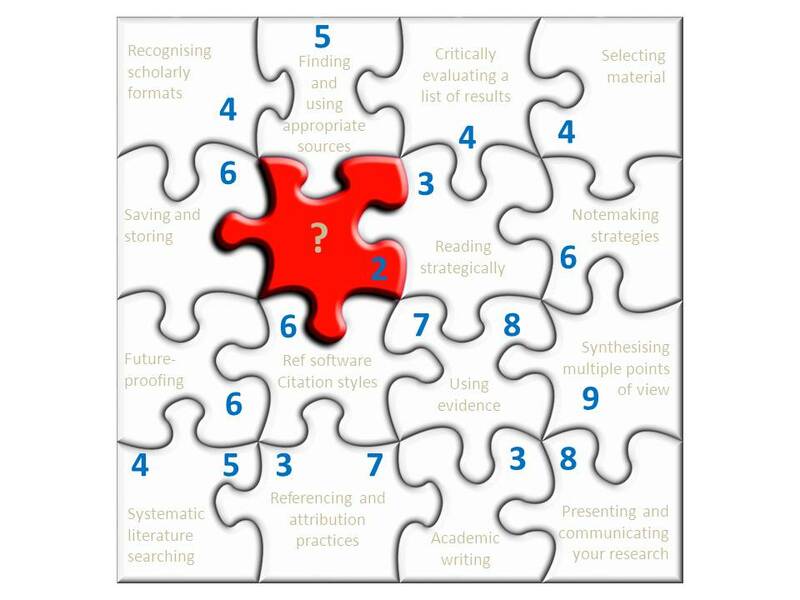 So here’s the research jigsaw I designed for masters level students. I plan to give an introductory session that touches briefly on each piece and how they interlock to create a framework for supporting research. 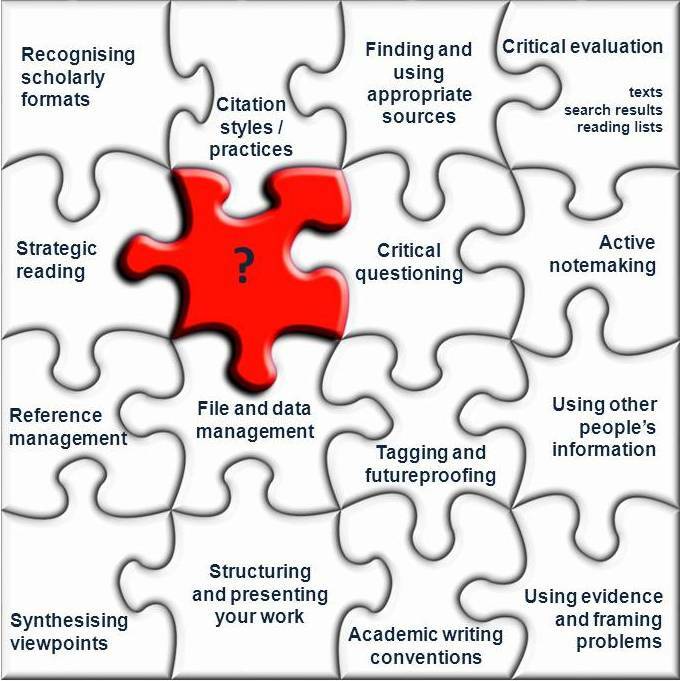 Later in the course we’ll focus on specific pieces when we look at various aspects of the research process in more detail, such as literature searching, information and data management, referencing and attribution, and academic writing. In this diagram the question mark could stand for creating and developing a research question, e.g. during the dissertation phase. It could also stand for the unpredictable ‘unknown unknowns’ that crop up during the process of doing research, including its emotional impact – stuff that can blindside you, throw a curve ball, or give you a new direction and impetus (sometimes all four). Finally, it also stands for the keystone of research: “never stop asking questions”. Between all the pieces all but the ‘transitional’ strands, 1 (Transition to Higher Education) and 10 (Social dimension of information), are addressed. Seeing that gap is a useful outcome to the exercise, all by itself.